teaching visitors about M¨¦tis culture.With only three more days until the end of the Pan AM Games and the first half of the Aboriginal Pavilion, the M¨¦tis Nation of Ontario (MNO) Summer Youth Cultural Program (SYCP) has received many visitors at the M¨¦tis booth. Located at the Fort York National Historic Site, the M¨¦tis booth represents a fur-trade era encampment. ?People?have submitted many pictures about the activities and visitors as well as some additional pictures of the MNO citizens who participated in the Pan AM Games Opening Ceremony. 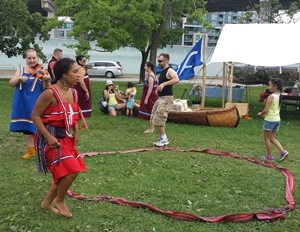 Click here to read about the MNO's participation during the Pan AM Games Opening Ceremony. Here is a sample of some pictures that have been shared. M¨¦tis jigging lessons were led by violin music. ?Everyone is invited to join in. The MNO SYCP students received a visit from the Honourable Brad Duguid, Minister of Economic Development, Employment and Infrastructure. Alicia Blore teaches M¨¦tis finger weaving to a visitor from Hungary. MNO citizens posing with other performers from the Pan AM Games Opening Ceremony. ?Second from left (front): Alicia Blore, Joanne Burt, Christine Skura; back row: Liam Blore and Kyle Burton.